When Samsung, the world’s largest mobile phone maker, launches a new device, it is accompanied by a series of events and experiences that showcases its most exciting features. Featuring the newest Galaxy phone, the 360 stand allowed visitors to playfully interact with 360 images of beautiful locations around the world. The project was designed by karlssonwilker with third-party retailers in mind, allowing it to be easily installed and managed by any store staff. To highlight the hand-held interaction of viewing 360 images and video on the phone, each of the nine phones—per stand—is suspended using special rubber cables. 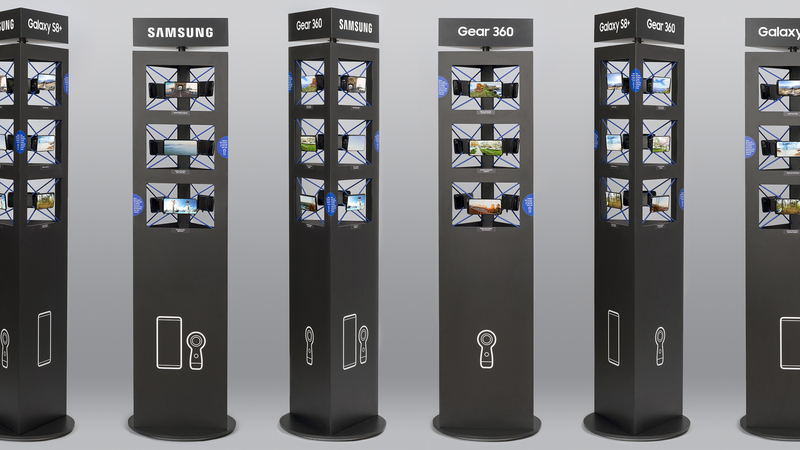 Easily rotating, pulling and twisting the device, customers get to experience Samsung’s 360 content from a seven foot turning stand that plugs directly into a wall outlet, with built-in wifi for any remote content updates.